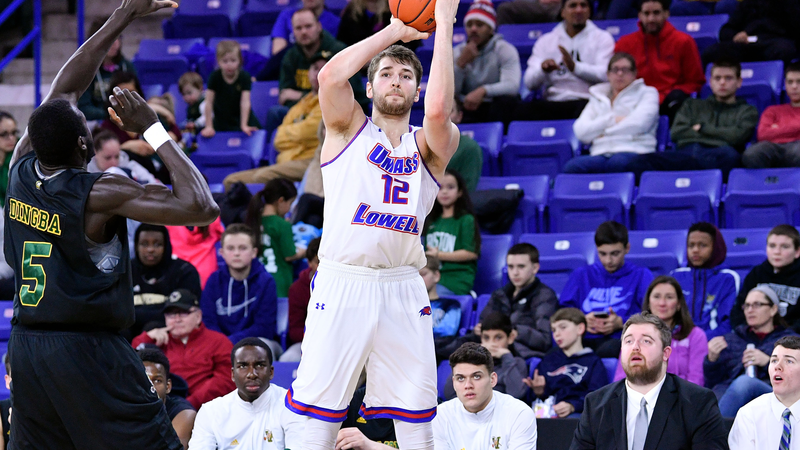 ALBANY, N.Y. – Five different River Hawks scored in double digits, as the UMass Lowell men’s basketball team (14-12, 6-5 AE) earned a decisive, 86-54 victory at UAlbany (8-17, 3-7 AE) on Wednesday evening. The decision marked the River Hawks’ first Division I win in Albany, sweeping this season’s series against the Great Danes. It also ties both the program’s largest margin of victory and fewest points allowed against a Division I opponent. Redshirt-junior Christian Lutete (Silver Spring, Md.) recorded his third consecutive double-double and his 10th of the season with 20 points and 11 rebounds to pace UMass Lowell on offense. Redshirt-senior Josh Gantz (Grove City, Ohio), who added 16 points, tied a career high with four three-pointers. Freshmen Darius Henderson (Pasadena, Calif.) and Alex Rivera (Lowell, Mass. ), and senior Shawn Jones (Bridge City, La.) all contributed 10 points on the night. As a team, UMass Lowell shot 57.6 percent (34-59) from the floor. Eight points from Henderson helped the River Hawks jump out to an early lead on the road. The Great Danes made it a two-possession game at the first media timeout, but Gantz sparked a 9-3 run that was capped off by a mid-range jumper from freshman Allin Blunt (Bowie, Md.) to help build a 20-10 advantage for the visitors with 10:44 remaining in the first. UAlbany was able to cut the difference to eight twice before a tip-in from Rivera and back-to-back jumpers from freshman Joey Glynn (Portsmouth, N.H.) extended the River Hawks’ lead to 30-16 at 6:12. The Great Danes were back within single digits once more in the period, but UMass Lowell scored 10 of the last 12 points, including four from both sophomore Obadiah Noel (Frederick, Md.) and Jones, to take a 42-25 edge into the break. UAlbany came out of the break on the attack, scoring the first nine points of the second, although Rivera snapped the stretch with a step-back three and freshman Bryce Daley (Pittsfield, Mass.) followed with a layup to give the River Hawks some breathing room at 47-34 with 16:42 still to play. The home squad would use six straight points to make it just a seven-point game until UMass Lowell answered with a 13-2 run thanks to a trio of triples from Gantz and Rivera to pull away, 60-42, at 11:53. The Great Danes were within 18 twice more, but a 9-0 stretch later in the half, which was sealed with an and-1 from Lutete, put the game out of reach inside of the final three minutes. The Great Danes still own a slight, 11-10 edge in the all-time series. The River Hawks wrap up their three-game road swing on Saturday, February 16 with a 1 p.m. tilt at UMBC.